There's a problem in the small village of Rimmington: all of the men have fallen into a deep slumber and cannot be awakened. Can you solve the mystery before it's too late? Speak to Lucille in her house located in Rimmington. 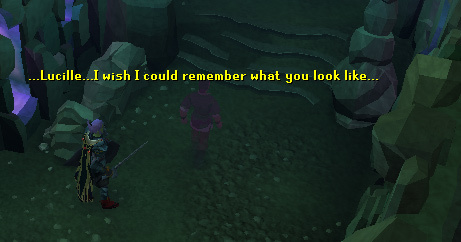 Note: This quest is a fully voice acted quest and, as such, it is recommended you complete this quest with sounds and music set to "On" in the RuneScape options to get the full experience from this quest. To begin the quest, speak with Lucille in her house in Rimmington. Lucille will inform you that she is unable to wake any of the men up, and that they keep muttering crazy things, as if sharing the same dream. She informs you that "The Raptor" had previously offered to help her, received a potion of restless sleep, then disappeared. She says that you will need to do the same in order to catch up with him. Drink the potion, and you will be informed you have fallen asleep, but still retain some control over your body. 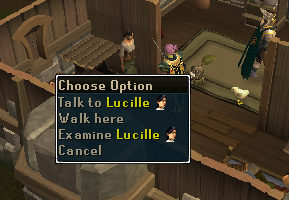 You will still be in Lucille's house in Rimmington, but no longer able to communicate with the NPCs who are not in "The Land of Dreams". Step outside of the house, where a "Dreaming Soul" will inform you "...I heard her first... Stay away from her..."
You can follow the soul, or make your own way to the cave slightly northeast of Lucille's house. Enter the cave. Her tale, will, in turn be interrupted by The Raptor. In his haste to taunt "the witch", he silences her, and leaves, grumbling. Continue to follow the path around. You will eventually come upon The Raptor himself, who warns you that you cannot stop him, and laughs, telling you it is too late to save Waylan. He states the only thing left to do is kill the Haunting Voice, warns you to keep your distance, and proceeds deeper into the cave. So, I sang an old mermaid song, and then on the docks listened. This is again, an instruction to take the southern door, and then the eastern door in the caverns you emerge in. Following these instructions once again brings you in a large cavern, which is occupied by a Dreaming Soul, where the Haunting Voice speaks to you again. She informs you she once sang to a group of sailors on the docks, and her singing caused them to rush out into the water to meet her. However, they made no effort to swim, and ultimately drowned. She put their bodies back onto the land, and returned home in a state of sorrow. Her sisters taunted her, and the town changed its name to Witchaven, in remembrance of what she had done. Following the path along, the Dreaming Souls will whisper messages such as "If any of you touch her, I'll kill you." "...why can't I go back? ... Why must I keep going forward?" and "My body is yours, forever." 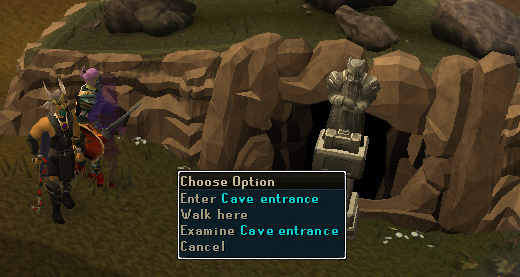 Enter the door at the end of this cave. Doing so brings you into another large, dreaming soul inhabited cave, with large pillars containing runic symbols and a portal entrance. The Haunting Voice speaks to you, telling you her tale again. 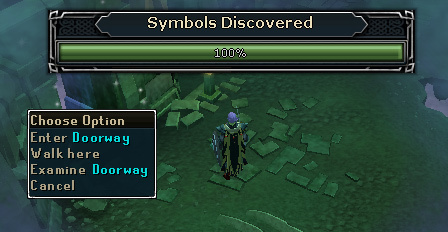 You will emerge from the cutscene standing on a symbol, a bar will appear at the top of the screen, which reads "Symbols discovered; 33%". 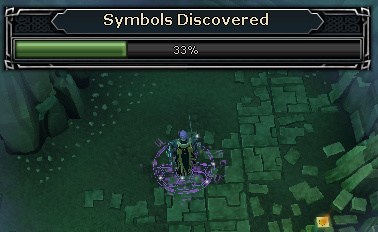 In this room you must now uncover the remaining symbols to progress. One symbol is in the northwestern corner of the room, stand on it to uncover it, the other is on the northeastern side, stand on it again to discover it. After discovering the third, the Haunting Voice speaks to you again, telling you of another time she sung to men, in a field. This time, they attacked each other, killing each other. A door will appear in a random location in the room, go through it. 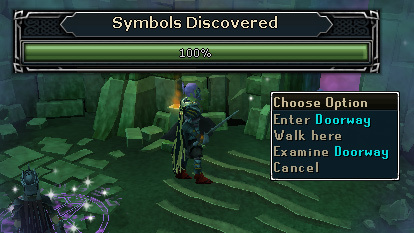 You will emerge in another large chamber, where you must once again discover symbols on the floor by standing on them. One is in the northwest corner, another is in the middle of the Western section of the room and the third is in the middle of the eastern section. Each time you discover a symbol, she will tell you more of her tale. After finding all three, another door will appear, immediately east of where you entered. Go through it. You will again emerge in a cave, where the voice speaks to you, and Dreaming Souls will walk the path which you must now take. She tells you one day she came across a soul that would not love her as she sang to it. It rejected her. In this cave the Dreaming souls will utter messages such as "I no longer want my body.. Take it... Take it!" "I see you looking at her, I'll have your head!" and "Lucille.. I wish... I could remember what you look like...", this is Waylan, the man you are here to save. You will emerge in a new kind of cavern, and will once again be spoken to by the Haunting Voice, she tells you more of the soul that would not love her. From the centre of the room, pick up the burning sapling, and place it in a plant pot, the plant-pots will be surrounded by some form of graphic, and you must then go through the door which corresponds with the graphic on the plant pot. After you have gone through the correct doorway, the Haunting Voice begins to tell you more of the soul burning down. You will need to remove the sapling from the place and place it in the next type as her tale specifies. The pots/doors in order are water, fungi, ivy and finally cobwebs. You can examine the pots and doorways in order to discover what they represent. You must repeat this process, until going through the doors tells you four parts of the tale. Each time you do this, the sapling will grow larger and larger, until eventually it becomes a full grown tree, in the centre of the room. This will unlock the next path, the Northern doorway, go through this door to continue. You will enter another cutscene, where the Voice tells you that her tale ends, and that all is left is to repeat it. The souls will then march to hear her story once more. The Raptor now reappears and states "this is the end of the line." He tells you nobody could survive that jump, and that it would be foolish to even try. Naturally, he then makes the jump. Follow him downwards. You will find yourself failing the jump, and getting snapped up by the waiting jaws of a scary looking beast! You will return from the cutscene to find yourself in his foul belly, unlocking the music track "Belly of the Beast." Horrifyingly enough, you will find yourself surrounded by skeletons and some low level monsters. Start to head east, deeper into the belly of the beast. Be sure to avoid the yellow pits, as walking into them will cause you constant damage until you leave. Enter the opening to the southeast of the beasts's belly. Follow the next chamber to the opening at the southern "wall". Then follow the third chamber to the opening in the southeast corner. 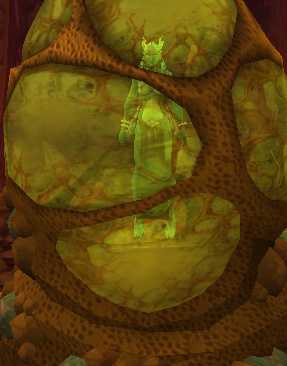 You will then find yourself in a square chamber, with the "Haunting Voice" being revealed to be a Siren, who is encased inside some form of sac. After conversing with her, she warns you that the "old woman" will not be happy you have intruded. You, in turn, tell her that you are trapped in the belly of a dragon, she humours you, for now. She will sing the "waking song" and begins to realize that she has been trapped. She then starts to question who is responsible for this horror. You learn she was tricked by the "old woman" into singing, causing the souls to come to her. However, in singing her "waking song", the other souls have been returned to their bodies. After agreeing to help her escape, she tells you her name is Remora. She was eaten by the dragon, when wearing a necklace, which would help you both escape. Timely as ever, the Raptor appears, vowing to put an end to her witchcraft. You will begin to protest with The Raptor, claiming she is innocent. He agrees not to kill her, only on the grounds that she is the only way that you can escape, by finding her necklace to teleport out. You will then grab the Coral Crossbow on the ground, and shoot the cyst to release The Siren. This angers the dragon, who spits you out, and breathes fire on her. You grab the necklace and teleport both yourself and The Raptor to safety. You will emerge in the White Knights camp, from here you can now access a new slayer dungeon, which houses a range of monsters, including the ferocious Queen Black Dragon! You will begin a conversation with The Raptor. He informs you that you have saved all the villagers, and that his new target is the Dragon who had eaten you both. He also tells you that the Siren was killed by the dragonfire, and that it was for the best. You conclude it best to return to Lucille, and The Raptor tells you that you should go to see her alone. 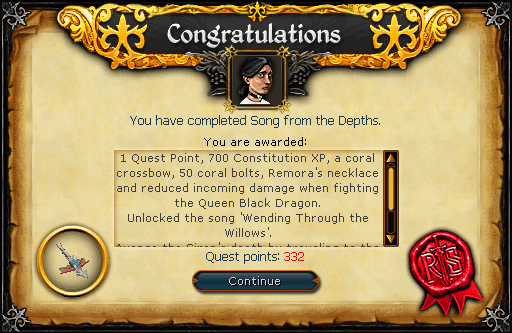 The Raptor then hands you the Coral Crossbow, 50 Coral Bolts and Remora's necklace. You must now return to speak to Lucille in Rimmington. Speaking to her, both she and Waylan thank you, promising that Waylan will never drink again (yeah, right!). 700 Constitiution experience A coral crossbow 50 coral bolts Remora's necklace Reduced incoming damage when fighting the Queen Black Dragon The song "Wending Through the Willows." 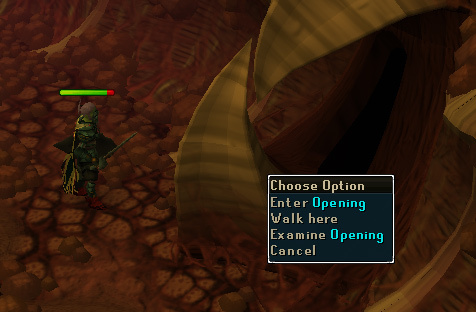 The ability to avenge the Siren's death by traveling to the White Knight encampment, south of Falador. Two spins for the Squeal of Fortune. 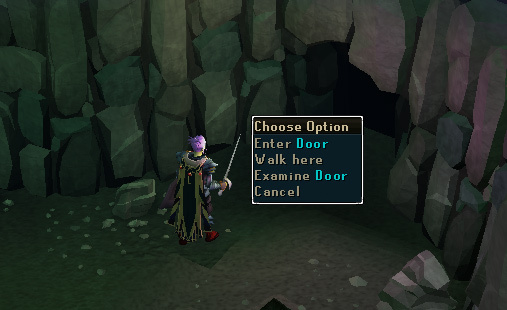 Returning to the cave you accessed during the quest allows you to follow a second set of instructions. Doing so will allow you to study ancient writings on a wall in a cave, which will grant you 30,000 Constitution XP, if you have level 80+ Constitution. You will also take approximately 60 LP damage obtaining this reward, as such, it may be advisable to bring a small amount of food.